There are holiday homes, and there are fantastic holiday homes. The trick that separates the two is in the interior design and finishing touches – a beautiful, character-filled space that makes for the perfect getaway. 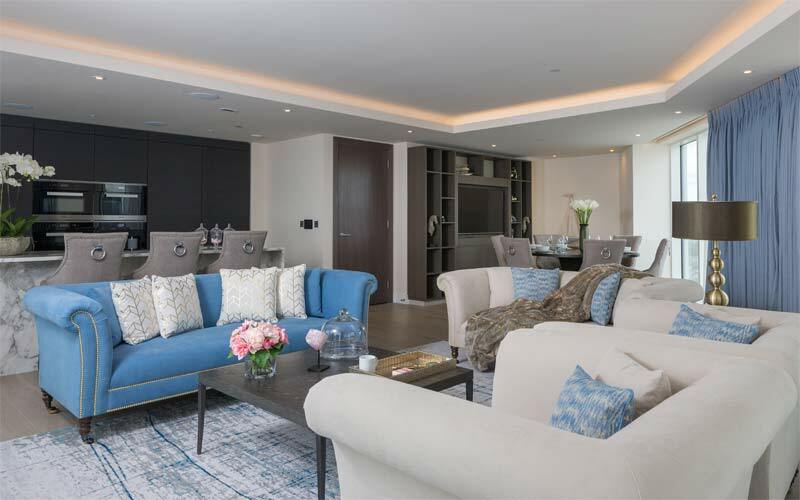 Approached by clients based overseas to manage a bespoke project for their three-bedroom apartment, in Berkeley Group’s stylish waterside location Chelsea Creek, the ani M Interiors team set out to create a stunning home away from home, with an air of modern classic design and luxurious, high quality furnishings. What followed was a seamlessly designed interior, with every space of the apartment illuminated and accentuated with the finest furniture, fabrics and finishes. A glorious mix of blues, contrasting textures and modern pieces brings an artistic quality to the living room. With their powder blue and beige upholstery, rolled armrests and delicate legs, elegant sofas and armchairs sit pretty in the open-plan space. A statement rug and patterned cushions beautifully complement the dark wood coffee table, while the soft blue tones of the floor-to-ceiling curtains bathe the room with a fresh and calming atmosphere. 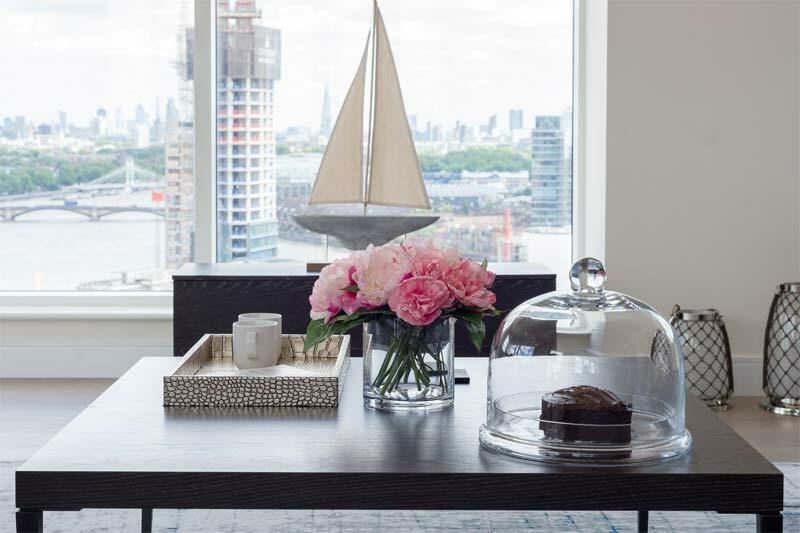 Not forgetting the finishing details; a vase of blooms, quartz stone and serving tray adorn the table top, lending a highly personalised, unique touch – an important factor in creating a holiday apartment with a homely feel. Last but not least, a velvet throw and metallic ball table lamp add an edge of luxury to the living room, and bring the scheme together in a stunning display of classic yet contemporary design. 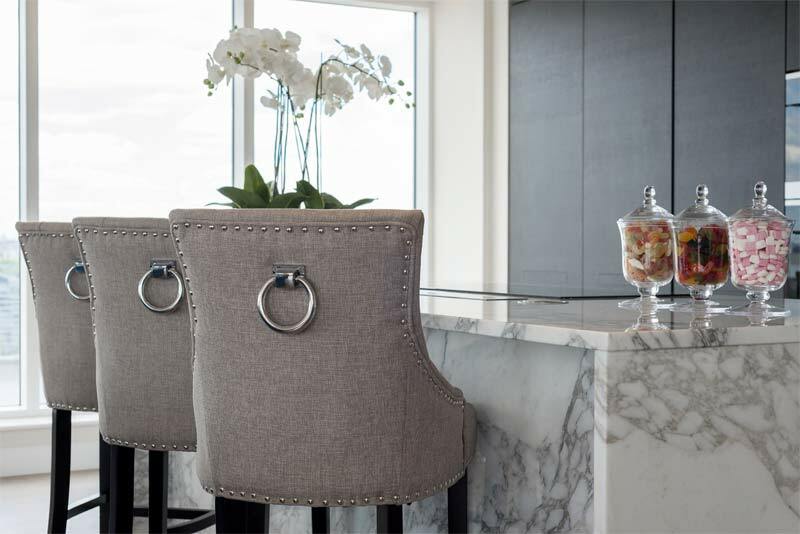 Continuing this attention to detail in the open plan kitchen, provincial-chic bar stools with chrome stud detail and ebony legs stand sophisticated and tall, and blend perfectly with the marble island worktop. In keeping with the kitchen’s minimalist style, simple, pared-down statements like white orchids and sweet jars lend just the right amount of elegance to the space. One of the client’s favourite parts of the apartment, the dining area is a visual feast. Handsome high-back chairs surround a bespoke, dark wood dining table, complete with silverware and a statement vase. 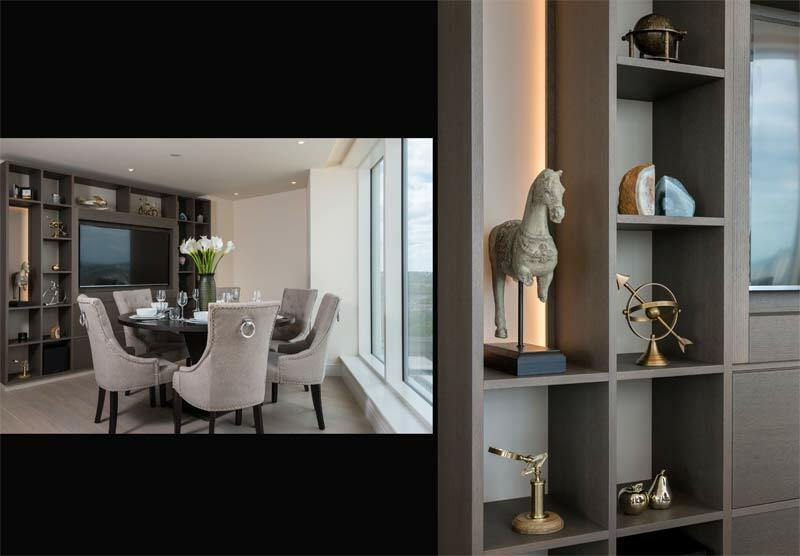 On the left wall, a floor-to-ceiling shelving unit features a wonderfully unique range of decorative accessories, from a globe ornament to a Dynasty horse sculpture – a lovely hint of antique charm amid contemporary furniture. Complete with large windows overlooking the capital’s tree-lined avenues and meandering waterways, the dining area elegantly reflects its surroundings to merge glamour with an urban, cosmopolitan feel. The apartment’s master bedroom boasts a mix of glitz and bygone glamour with its graphic patterns, bold-shaped furniture and beautiful gold detailing. 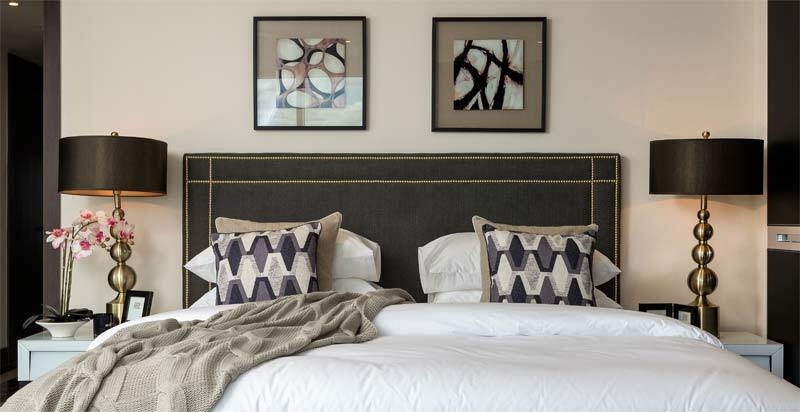 Perfect for propping up to read, a bespoke headboard, with charcoal upholstery and studded detailing, completes the room’s luxurious king-size bed. Geometric cushions and abstract art act as a striking focal point, while stacked metallic ball lamps lend a subtle, sophisticated glimmer. 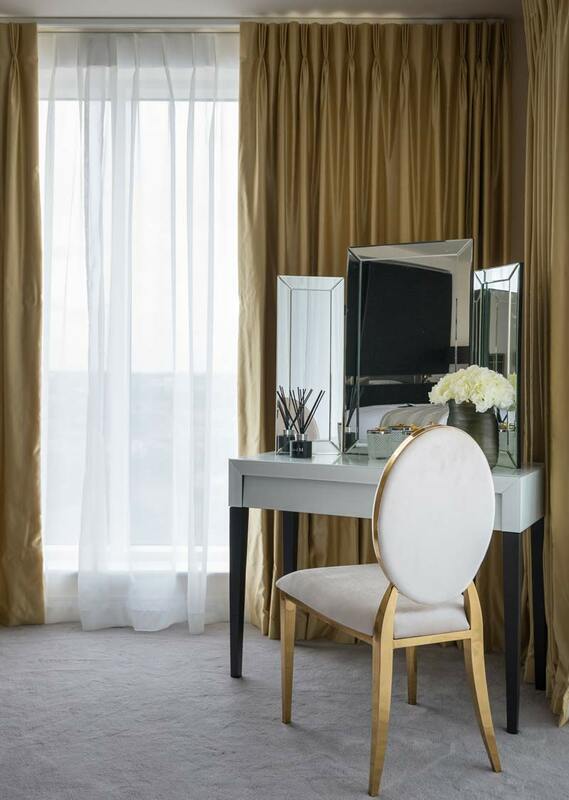 These luxurious gold accents are continued in the vanity corner, with a metallic framed Versailles French-style chair and glistening gold drapes dripping in opulence. Ultimately, the master bedroom’s layered colours, tones and textures combine to make a truly sophisticated, lavish retreat. Designed for teenagers, the apartment’s two other bedrooms balance modern style and functionality. Neutral fabrics and dark wood accents are contrasted with bold pops of colour, and soft furnishings, artwork, flowers and décor add a sublime depth and character to both spaces. By the windows, sleek work desks and chairs offer a space to unleash creativity or study effectively, with draw curtains at hand to enjoy the view or retreat from the world. With houses across different countries, the client seeked a completely unique interior, different to any other they had lived in. Receiving this brief, the ani M team combined their keen eye for detail and design skill to create an exquisite space, with tasteful furnishings at every turn. If you too have an unfurnished property in London that you would like us to oversee and manage on your behalf, our designers would be more than happy to assist. Contact us today.